Never in tech history have so many bought so much in such a short time. There was a memorable tweet sent in the final days before the first iPad was released: Someone in tech — and I forget their name and can’t find the tweet, sadly — noted in less than 140 characters that they were about to embark on their last weekend before they would never have to have another without an iPad. Such was the market excitement for the category-creating device. 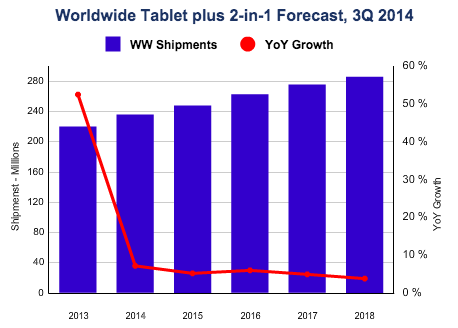 The growth in the tablet market that followed was explosive. But then something odd happened: The tablet market matured all at once, and fresh consumer appetite for small, touch-based slates tempered as regular folk held onto their devices longer than expected. Tablet market growth will be moderate for the foreseeable future. The compound effect of the yearly growth rates that IDC predicts actually keep unit volume growth somewhat healthy for a bit, but as that red line tapers to the right, you’ll note that the delta between blue columns starts to look pretty slim. As TechCrunch recently reported, IDC expects Apple to see sales of its iPad fall, and then recover to end up with 24.5 market share in 2018. Android, which will see the largest expansion of its unit volume in gross terms over the next few years will endure its market share slipping from 67.7 percent this year, to 64 percent in 2018. And Windows-based tablets will triple their unit volume and more than double their market share by 2018. That last expectation surprised me. What would drive Windows tablets up so quickly — aside from its modest numerical starting point — in a maturing market? I think that we’re starting to find out. Today the Microsoft-watching community is buzzing about a number of sub-$100 Windows-based tablets that, while limited in terms of their technical specifications, cost less than a hundred frakking dollars and run Windows. So Microsoft’s move doesn’t harm it financially, and could reap it precisely what it needs: market share. So we have Microsoft in the market, via its partners, with incredibly cheap devices, and Google pressing ahead with low-cost Android units that have become massively popular. Apple’s unit volume will drift higher as Microsoft and Google combat more fiercely for the majority of predicted growth in the market, according to IDC. I think that we’ll therefore see a real fight in the low-end of the tablet market. Put more simply: Apple’s ownership of the high-end of the market won’t budge, implying that open unit shipments viz IDC’s expectations are likely cheaper devices. So, that’s where the brawl will be. Over the next 6 months, what will be most interesting to see if lower-cost Windows tablets can attract more consumer attention than expected. If so, IDC’s 2018 numbers might start to yaw. For now, you have quite a number of options on the cheap. Christmas should be easy enough.